Here is part 2 of the interview that I did with Ryan Faehnle on 3 Steps to Changing Your Body Composition. Now lets get to part 2. Rick Kasej: Looking at people and their fat loss goals, a lot of times it relates to body composition. And when they end up reaching the look that they want and the body composition that they want, they need to go back to regular life when it comes to diet and exercise and people end up getting that rebounding weight. What can people do when they switch back to their regular diet and maybe ease off on the exercise to prevent that rebound effect happening in their weight and body composition? Ryan Faehnle: That’s a very good question Rick. The answer is actually two fold. The first thing that needs to happen in order to prevent a rebound is not to let your calories get too low in the first place. Anytime you do a crash diet or an emergency diet, something where you are dropping calories very low which a lot of people do when they are getting ready for the beach or a vacation or what not, what happens is at that point your body feels like you are starving. And so when you do gradually re-introduce food it is going to hoard it and that’s when you get that rebound weight gain. So the first rule is — don’t wait until the last minute to get in shape. You have to allow yourself a longer time and that’s going to make it more permanent. So what’s lost fast is gained back fast. What’s lost over a long period of time will be maintained for a long period of time. If you take 26 weeks to lose your 15 to 20 lbs, that’s going to be much more permanent change than if you try to do that in 5 to 6 weeks. It can be done, you can lose 20 lbs. in 6 weeks but then you are setting yourself up for a rebound. Your next part of preventing rebound weight gain happens after you decide to adjust to a more normal style of eating. In this case you need to do what’s considered reverse dieting. Instead of going instantly back to the way you use to eat you need to gradually add calories back in. Let’s say for example on your diet plan that you are down to 2000 calories a day, when you decide to go back up with dieting and resume your more normal eating you can’t just jump up to 3500 calories right away because that’s asking for trouble. What I would recommend is add maybe 100 to 250 calories per week until you are back up at that calorie level that you want to make. Rick Kaselj: Okay. Looking at a couple of things that you mentioned like people will end up losing lean body mass and they will also end up going on a low carb diet. Now what that will end up doing is affecting people’s metabolism. How can people prevent a slowdown in their metabolism when they are on a diet and looking at changing their body composition? Ryan Faehnle: This is actually a very good question, it’s the one that your listeners are going to like to hear the answer the most. The answer is: You need to have a planned cheat meal or cheat day happen at least once every 7 to 14 days. And what it does, when you go to a period of reducing calorie diet your thyroid gland which regulates your metabolism tends to slow down. Also, there is a hormone called leptin that is a gate keeper for fat loss. When leptin levels are high it allows you to lose body fat more rapidly. When leptin levels get low, body fat loss slows down or completely stops out. Now your leptin level will drop in as little as 5 days on a reduced calorie diet. If you have someone that needs 30 days in a row low calorie, those last 25 days they are operating at a slower metabolism so I recommend once every 5 to 14 days to have a cheat meal. And here is the rule for the cheat meal — it lasts for 2 hours. You have a 2-hour window not an 8-hour window or a 10-hour window. It’s a 2-hour window. You can have as much as you want of whatever you want making sure that a lot of carbohydrates and calories come from fat. This high calorie intake is what stimulates your leptin levels to jump back up so that your body doesn’t think that it’s starving. One of the biggest mistakes that you can make is to be too restrictive in your nutrition plan when you are trying to lose body fats. Again, it goes back to social side of things, no one wants to be a social hermit and live in their Tupperware all the time. You want to get out and be able to enjoy a meal with friends once a week. So the plan of cheat meal is probably the best thing that you can do to keep your metabolism from slowing down. Rick Kaselj: We focus a lot on the diet side of things, what is an exercise mistake that people often make when it relates to changing their body composition and losing fat? Ryahn Faehnle: Probably Rick the biggest mistake I see is an over-reliance on steady state aerobic work. When I say steady state aerobic work I mean going for a 30 minute jog, cycling for 45 minutes at the time at a constant pace. The thing about it is it can be effective for certain populations to lose body fats but there’s a couple of issues when relying too heavily on aerobic training. The first issue is that aerobic training actually makes you more efficient. If you think of it in terms of a car, you think like of Toyota Prius is a very fuel efficient car. You get a lot of miles for your gasoline. Well, you don’t want to get a lot of miles per calorie with your body. You want to be fueled inefficiently with your body because you want to be a gasoline calorie burning machine. You want your body to be a Lamborghini not a Prius. When you do too much aerobic work you just become too efficient then you have to do longer and more sessions. I am typically recommending aerobic work for no more than 6 days a week at a time. Either in one or two cases, either at the very start, so someone who may be morbidly obese, or they’ve never exercised before in their life will get some good benefits out of doing 6 days in a week of aerobic work. On the flip side, you have someone who has been weight training for a really long time and they are in the last 6 to 8 weeks of their program before their body building contest or before a beach vacation in which case it is acceptable in my opinion to integrate a little bit more aerobic work. But most of the training you do should be anaerobic in nature. Things like sprints, a 100 meter sprints, a 400 meter sprints, a big emphasis on weight training because weight training shifts your motor balance favorably for fat loss. By lifting weights with the proper technique, proper rest period, and proper load you can actually increase your body’s growth hormones and testosterone which are two things that are crucial for having a lean fit physique. Rick Kaselj: I have one more question for you. So you are done talking about the diet and the exercise side of things. Now, if someone wants to speed up their metabolism or fat burning is there a supplement or two that you would recommend? Ryan Faehnle: Yes, absolutely. No Fat Loss Program is complete without the addition of fish oil. Fish oil is kind of a superstar of supplements if you will. This lecture isn’t about necessarily medicine or health but if you type any disease into a research database and contrast it with fish oil you will find that fish oil benefits nearly every disease known to man, which is huge. They have lipogenic genes which are the genes that cause you to store fat, it turns those genes off like a light switch. Then you have lipolytic genes which are fat burning genes and it turns those genes on. Fish oil actually has the power to signal your very DNA which is amazing. It is truly remarkable. As far as those just go I recommend no less than 6 grams a day and up to 1 gram per percentage point body fat. So for example if you have someone who is in their 22% body fat you could get away with doing 22 grams of fish oil per day because it is going to basically replace all the bad fats in their bodies and unplug the reciprocities. So fish oil is the superstar. Rick Kaselj: Superstar supplement, that’s great. Those are all the questions that I have for you. Are there any last tips or insights that you want to leave people with? One last tip that I leave people with is to always make sure to focus on your physical performance when looking for fat loss progress. For example, I have never seen a 400 meter sprinter that ran the 400 meters in under 52 seconds that didn’t have a 6 pack. When I talk to people about fat loss, I always talk to them about increasing their physical performance. A 400 meters sprint is a big part of my programs, that I give to people and I always use that as a guideline. When you get your time under 52 seconds for sure without any hesitation you will have a 6 pack, you’ll be under 8% body fat and you will be lean. Always look to improve your physical performance in the gym, on the track, wherever you decide to exercise. Rick Kaselj: Oh, I have never heard of that, 400 meter under 52 seconds off, that’s a cool performance goal. Ryan Faehnle: Well, I’ve got a site called TheFatLossSolution.com. Basically, I’ve got a series of fat loss manuals that goes over every aspect of fat loss, that goes over training, nutrition, goal settings, psychology, becoming your own personal trainer, exercise technique, supplements, it’s kind of a whole shebang. I spent several years writing it to make sure that it is going to be good and useful for the people that will end up purchasing it. Rick Kaselj: Awesome. Ryan thank you very much for your time and thank you very much Exercises For Injuries readers, listeners, and viewers. Thank you very much for joining me and Ryan on this interview. 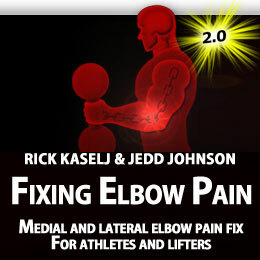 If you have an injury or pain, swing by exercisesforinjuries.com and enter your injury or pain there’s a good chance that I have an article or video for you that will help you out. Second thing is if you are watching this on YouTube, just head up above and hit subscribe and what that will do is you will end up subscribing to my YouTube Channel. Every couple of days you will get a video like this from me. Lastly, head down below and like this video or leave myself or Ryan a comment or a question and will make sure that we answer it. That’s everything, this is Rick Kaselj and Ryan saying take care and bye bye. Ryan Faehnle: Thanks for having me Rick, I appreciate it. Rick Kaselj: No worries, take care. This entry was posted on Wednesday, July 24th, 2013 at 1:16 pm	and is filed under Uncategorized. You can follow any responses to this entry through the RSS 2.0 feed. You can leave a response, or trackback from your own site.